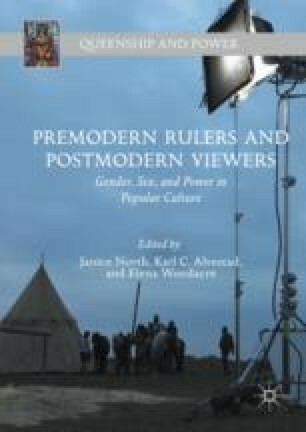 This chapter evaluates a large corpus of films and television series that feature the queens of the early modern period, arguing that these productions effectively categorize these women into five typologies: Victors, Victims, Villains, Virgins, and Viragoes. Examples are drawn from works across the twentieth and twenty-first centuries that demonstrate the five typologies, from the classic films of 1930s Hollywood, such as Katherine Hepburn’s starring role in Mary of Scotland to recent television series from Spain’s RTVE network on Isabel I and her descendants. The chapter ultimately argues that these typologies reflect modern society and gender constructs rather than the realities of early modern queenship. Foxe, John. The Unabridged Acts and Monuments Online or TAMO. HRI Online Publications, Sheffield, 2011. http://www.johnfoxe.org. “The CW’s Reign: Megan Follows on Catherine’s Royal Motivations.” Access Hollywood, October 24, 2013. https://www.accesshollywood.com/articles/the-cws-reign-megan-follows-on-catherines-royal-motivations-139074/. BBC “The Virgin Queen: Characters, Queen Mary” http://www.bbc.co.uk/drama/virginqueen/joanne_whalley.shtml. Lisa de Moraes, “CW’s first crunchy-gravel drama Reign flirts with history.” Deadline Hollywood, July 30, 2013. http://deadline.com/2013/07/tca-cws-first-crunchy-gravel-drama-flirts-with-history-552425/. T.L. Stanley, “Reign hopes to seduce teens with its tales of Mary Queen of Scots” Los Angeles Times, September 13, 2013. http://www.latimes.com/entertainment/tv/showtracker/la-et-st-reign-mary-queen-of-scotts-20130915-story.html.